Republican David Valadao currently represents Congressional District 21. Valadao is expected to win in 2016; however, this seat has the potential to be competitive due to Democrats having a voter registration advantage. Congressman David G. Valadao was born and raised in Hanford, California in the center of the agriculturally rich 21st Congressional District. As a lifelong resident of the Central Valley, he has been active in agriculture and dairy industry groups, as well as many local causes including Children’s Hospital Central California, 4-H, Future Farmers of America, and various Catholic Charities. The Valadao family immigrated from the Azores Islands of Portugal to the United States in 1969. After settling in the Central Valley, Valadao’s father started a small dairy farm in the Central Valley in 1973. Valadao was born April 14, 1977. The business now consists of two dairies, as well as over 1,000 acres of farmland in Kings and western Tulare County, on which Valadao and his family grow alfalfa, corn, and wheat as dairy feed stock. Intimately involved in the dairy industry, Valadao has taken on leadership roles within the California Milk Advisory Board, and Western States Dairy Trade Association. In addition, he was elected as Regional Leadership Council Chairman for Land O’ Lakes Inc.
Valadao attended local schools, graduating from Hanford High School in 1995 and later attended the College of the Sequoias in Visalia. He is currently a partner at Valadao Dairy and Triple V Dairy. Valadao married his high school sweetheart, Terra, in 1999. Together, they have three beautiful children, their most recent born April 2010. In 2010, Valadao was elected to represent California’s 30th State Assembly District. Valadao served on several California Assembly Committees including the Agriculture Committee, where he held the post of Committee Vice-Chair. 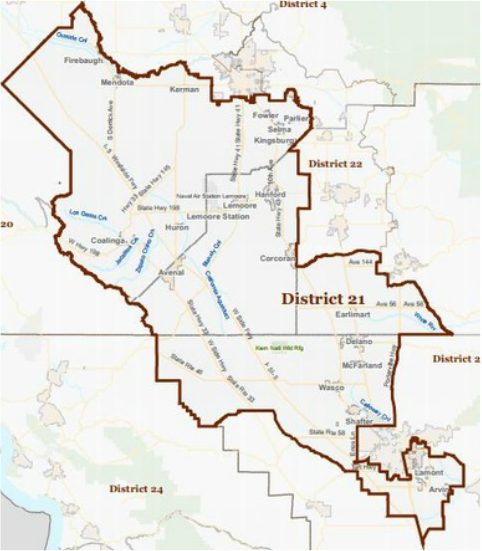 In 2012, Valadao was elected to represent California’s 21st Congress District which includes Kings County and portions of Fresno, Kern, and Tulare counties. Valadao is proud to serve on the powerful House Appropriations Committee, specifically the Agriculture, Interior, and Military Construction/Veteran Affairs Subcommittees. Congressman Valadao was reelected in November 2014.